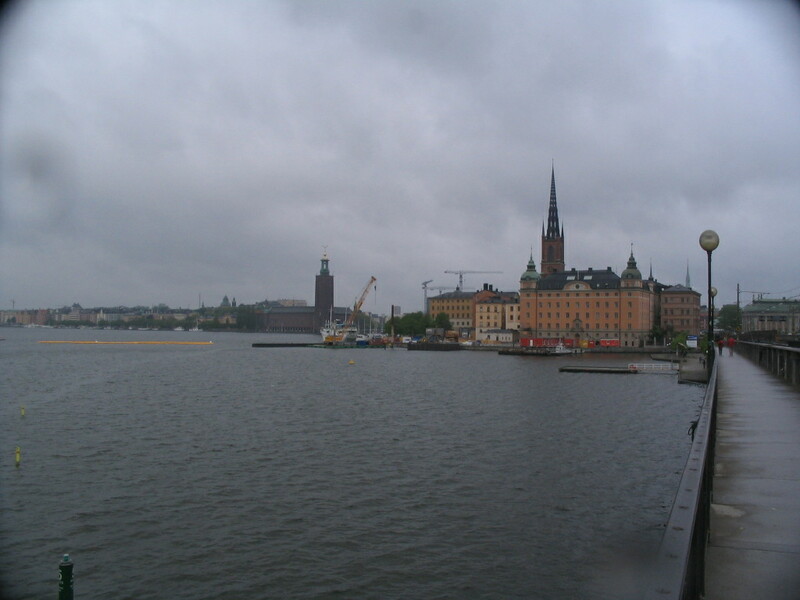 After James left, I still had about three hours before my train departed, so I had time to check out a previously unvisited area: Södermalm, the southern part of the center city. 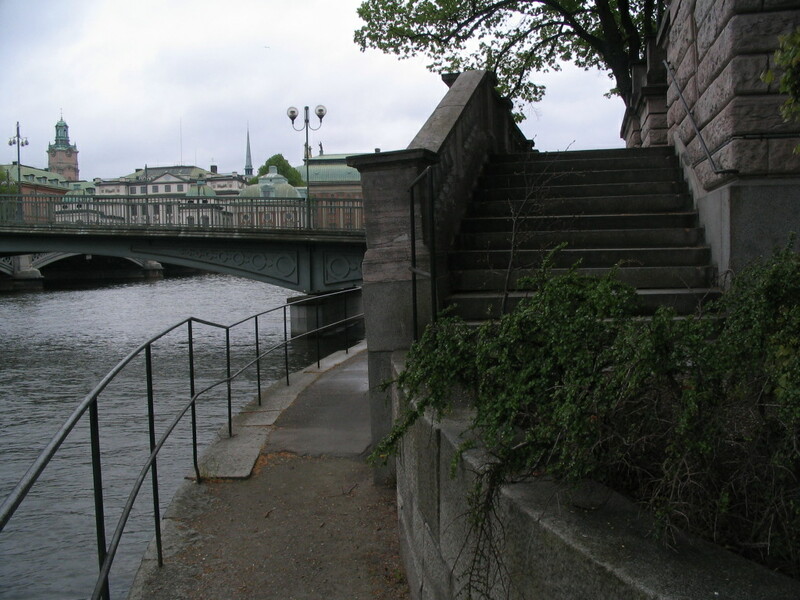 This involved another pass through the waterside plaza area at the edge of Norrmalm. 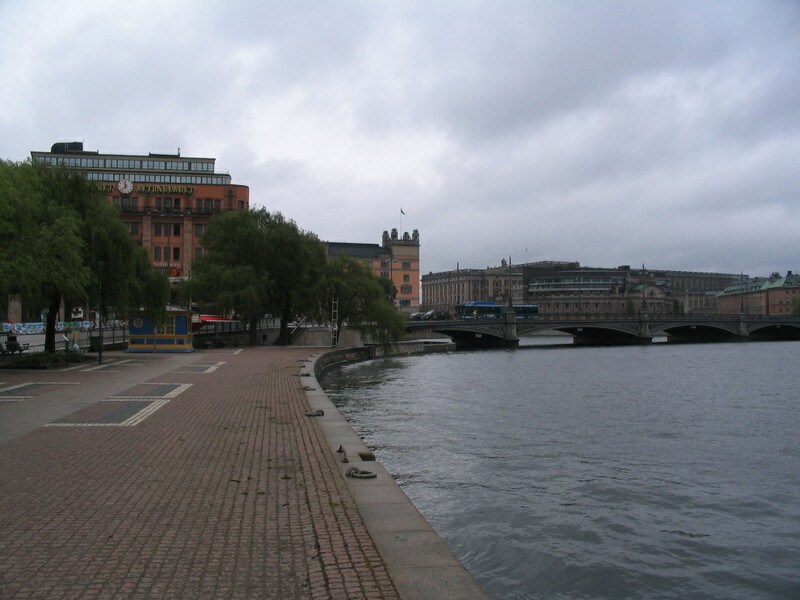 I took a side detour to the one-building islet of Strömborg and walked around it, coming up on this diagonal, fragmented view of bridges and Gamla Stan once almost back to the start. 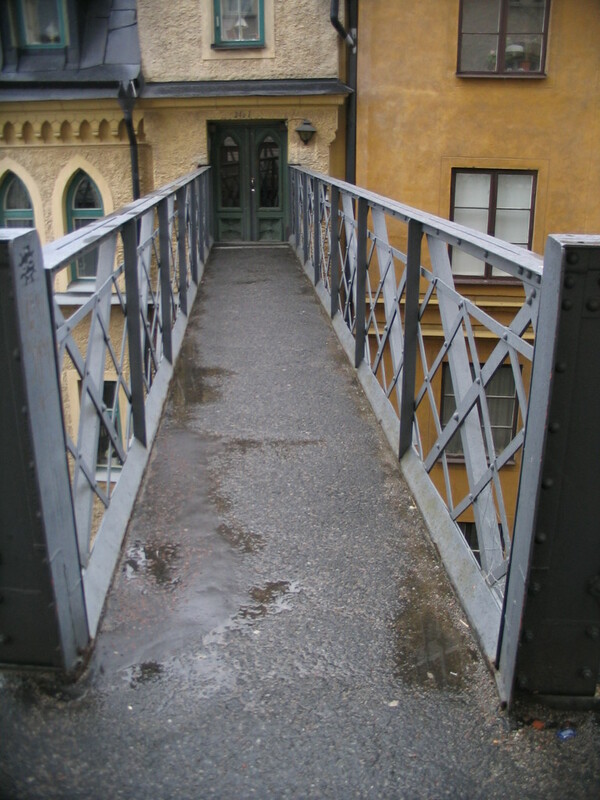 A bridge. Branching out from another bridge. 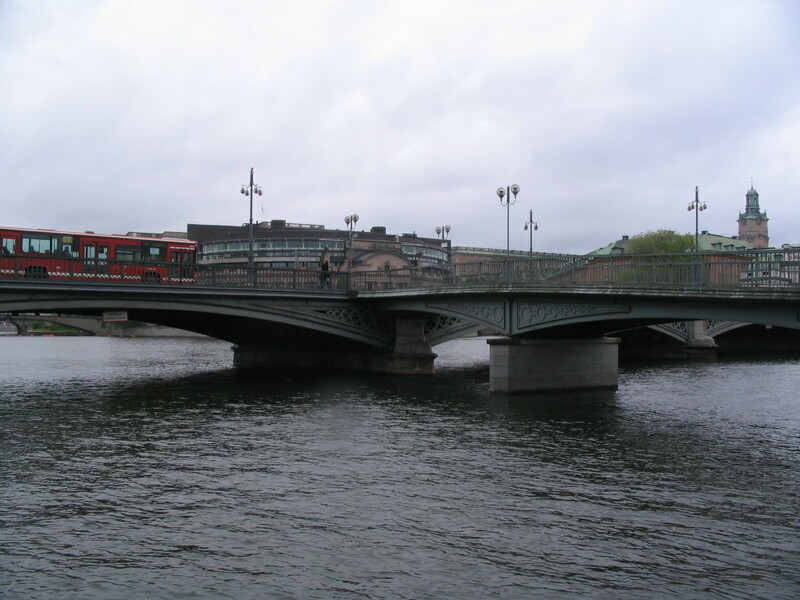 Specifically, Strömsborgsbron and Vasabron. The best thing. 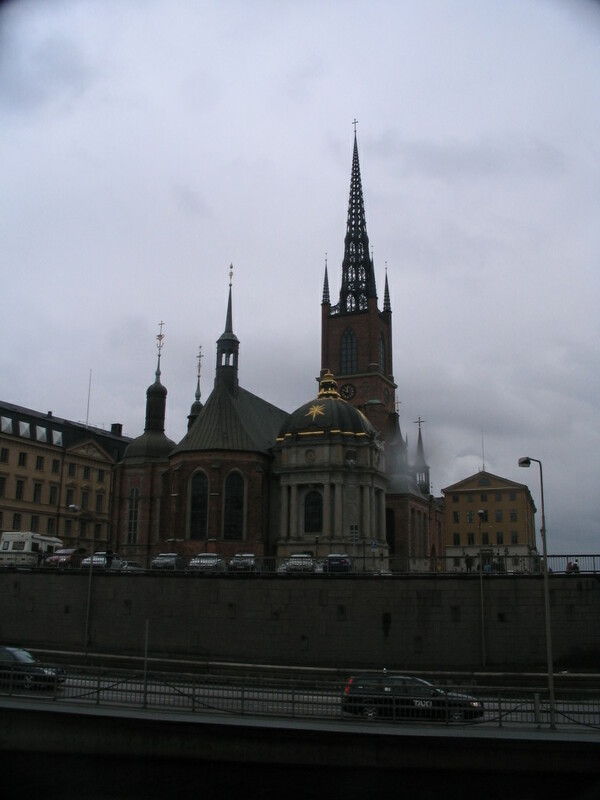 Traipsing by Riddarholm and its Kyrka once again. 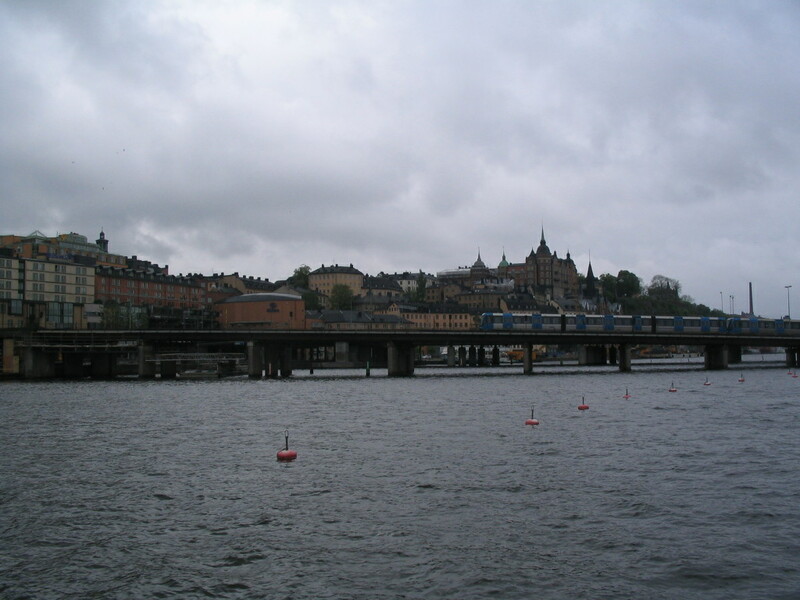 A Metro train zooms/trundles by in front of the Södermalm shore. 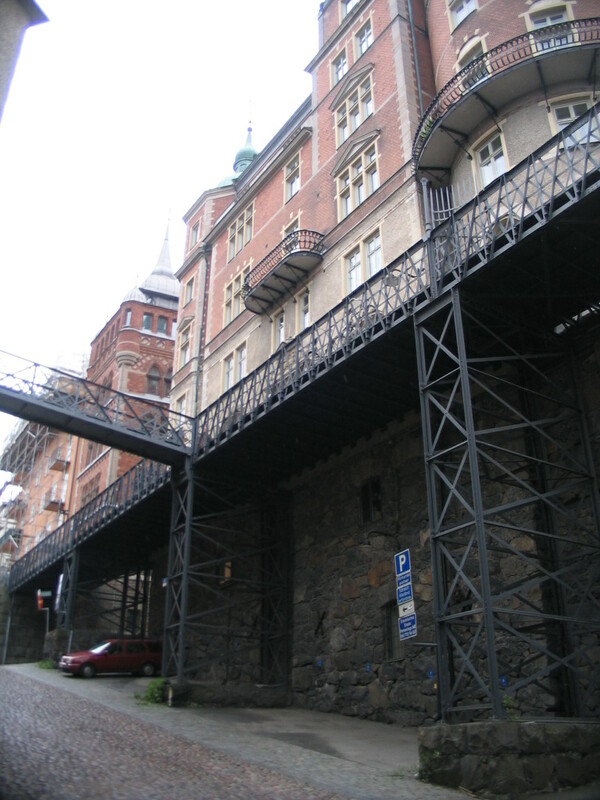 A clearer view of Katarinahissen. 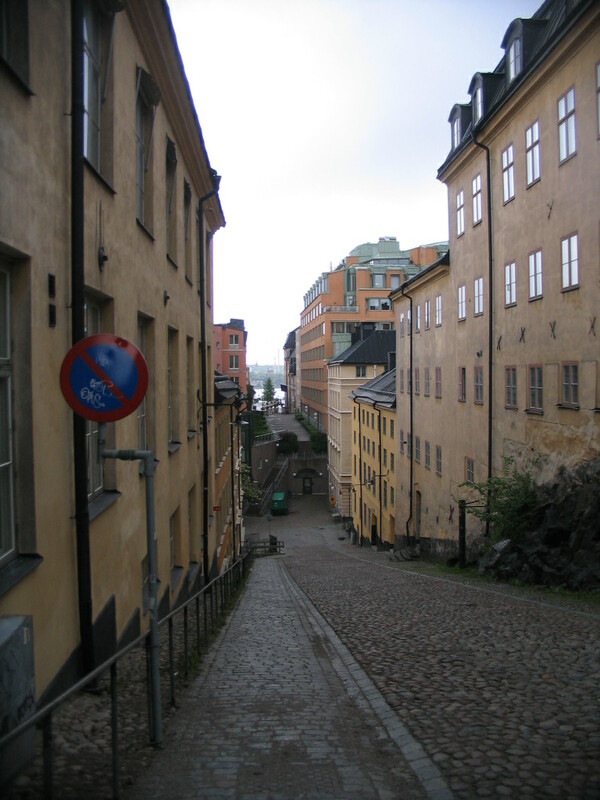 Once into the interior of Södermalm's streets: straight and flat, then straight but steep. 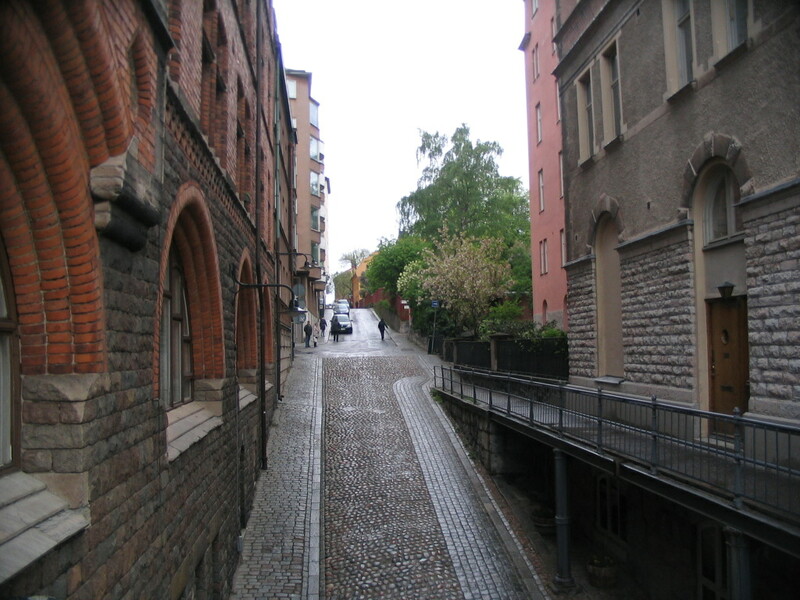 The crazy steep street is Brännkyrkagatan, the other is Bastugatan. Don't slip! 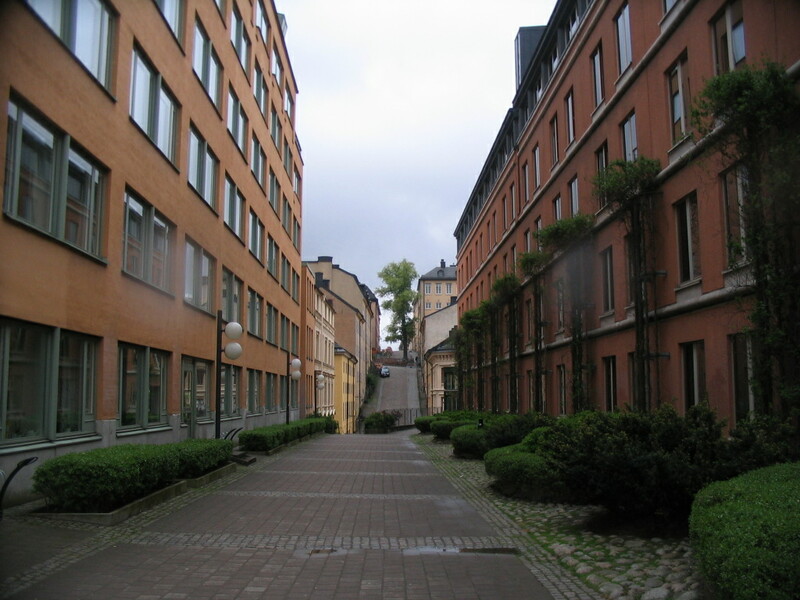 (This is looking back east down Brännkyrkagatan). 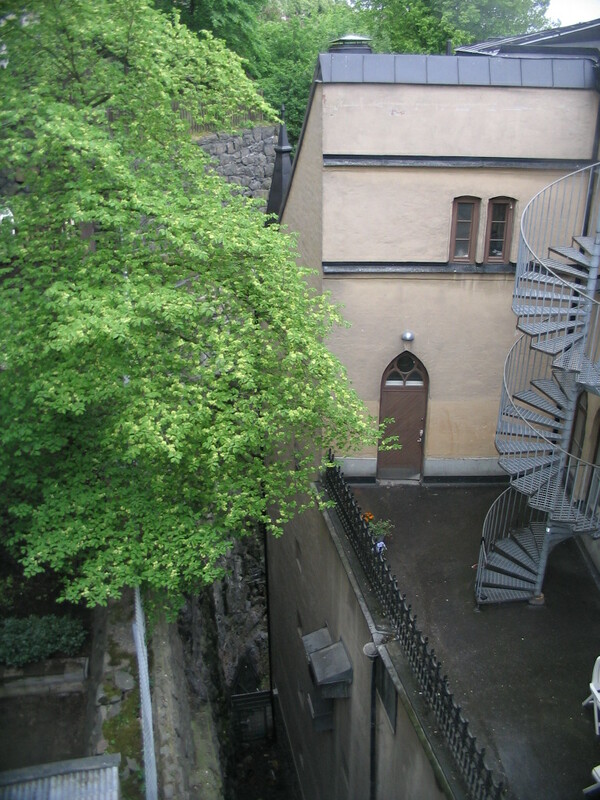 Maria Magdalena kyrka heaving into view from Maria Trappgränd. 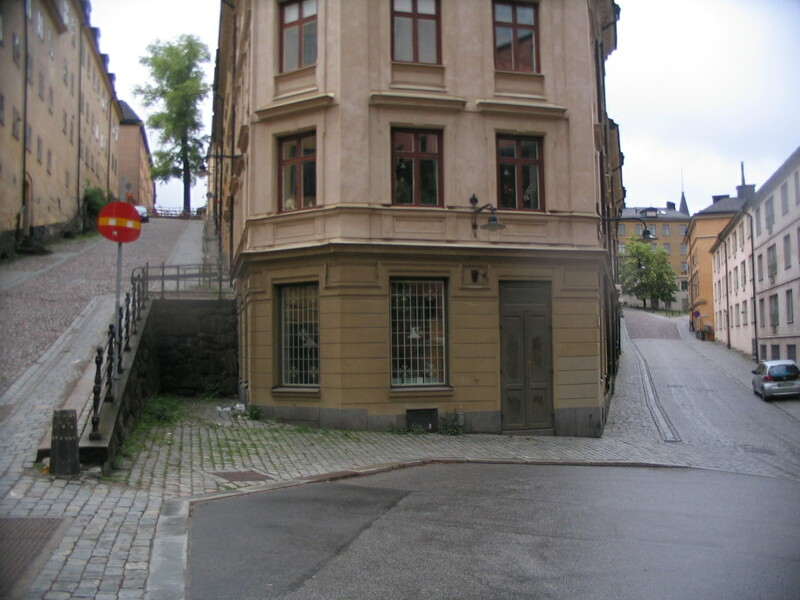 Looking west on Brännkyrkagatan from Bellmansgatan: I wonder why they cut the rock away for the left side (note the corresponding rock face in the building to the left) and not the right side. 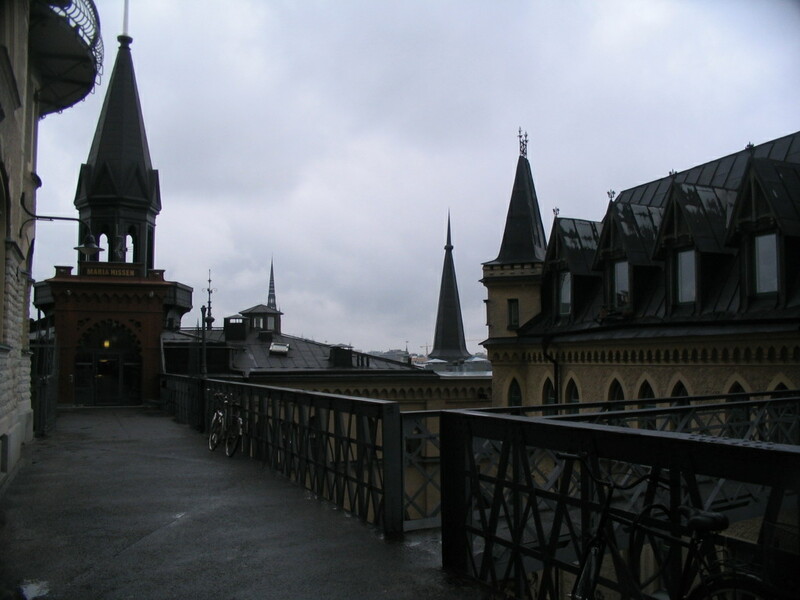 Bellmansgatan from an elevated walkway that I was delighted to discover. Check out those sweet rounded-brick arches too. 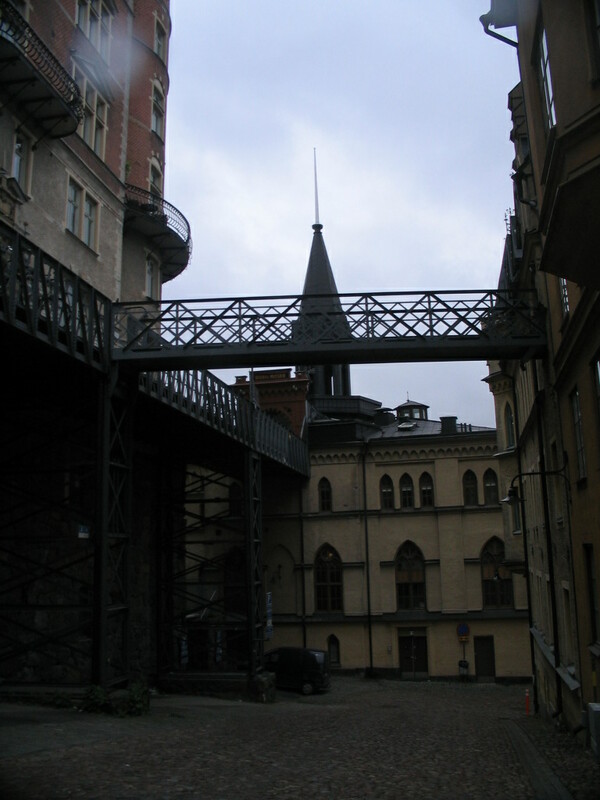 At the end of the Bellmansgatan walkway is this other old elevator, Maria Hissen, that goes down to the shore. Is that another side bridge? Bingo! 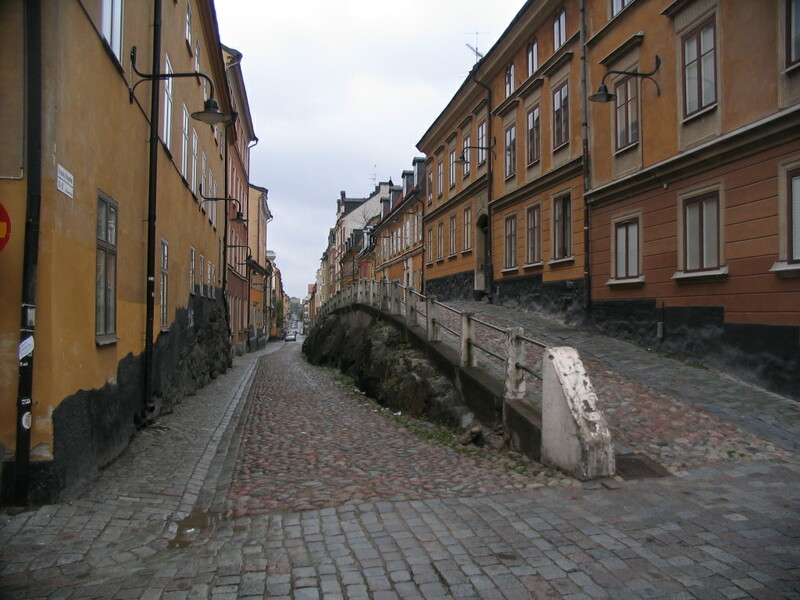 Stockholm, city of compound bridges. So cool. A somewhat fearsome gap on the west side of the walkway. 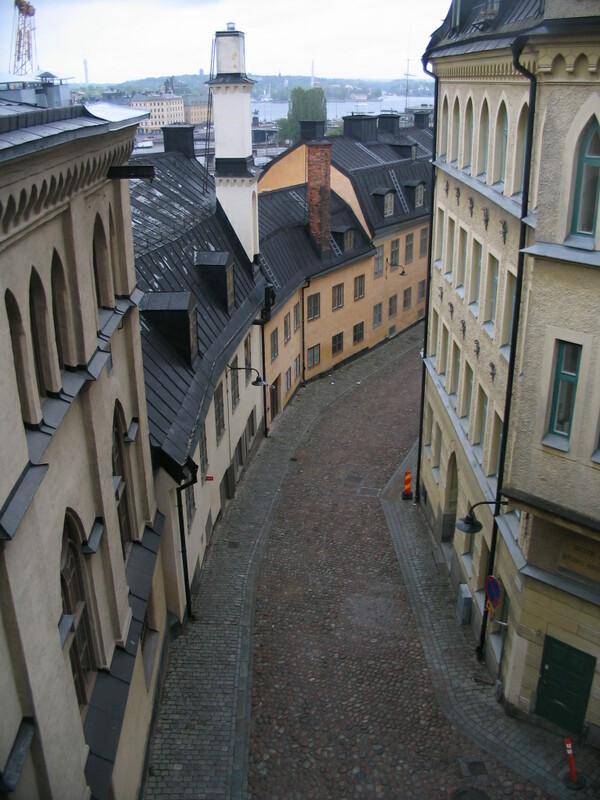 Pryssgränd curving out of sight just below, with a bit of a view back to Gamla Stan and beyond. 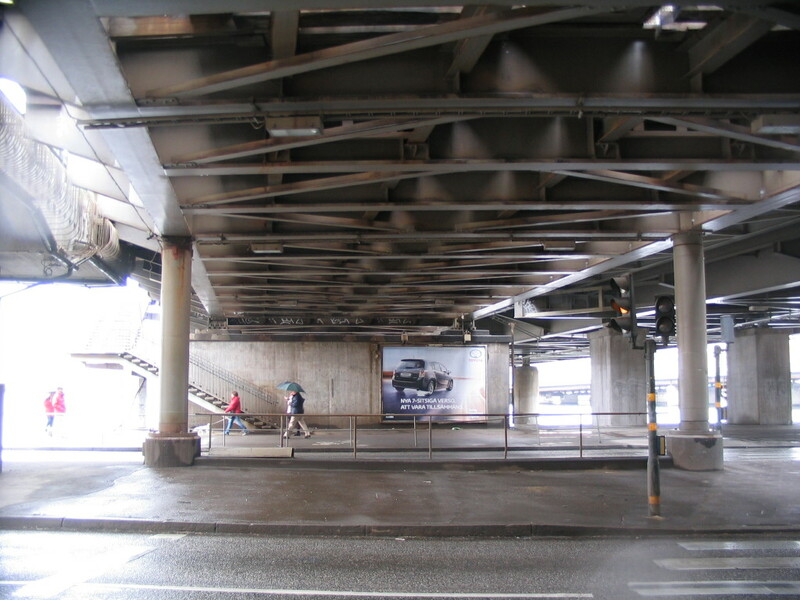 The view of the walkway and side bridge from ground level. The bridge straight up from below. 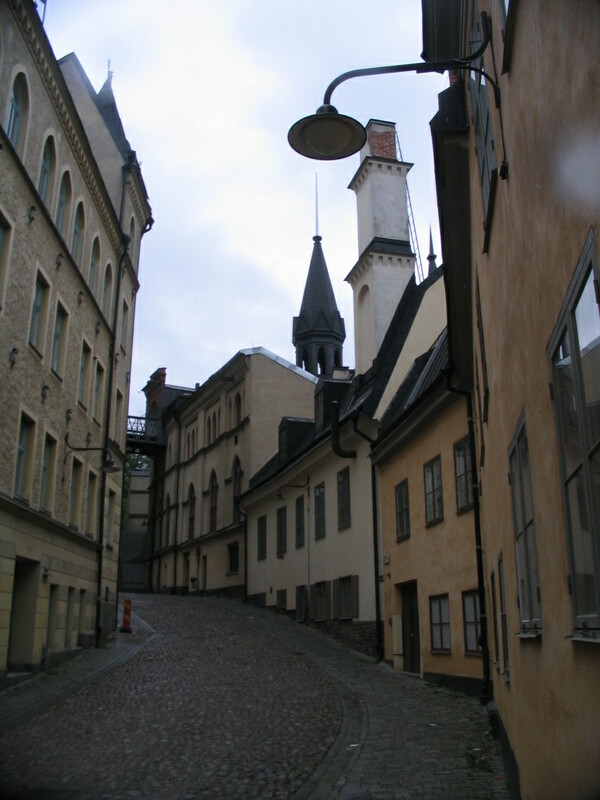 Going down Pryssgränd, a last look back up to Maria Hissen. 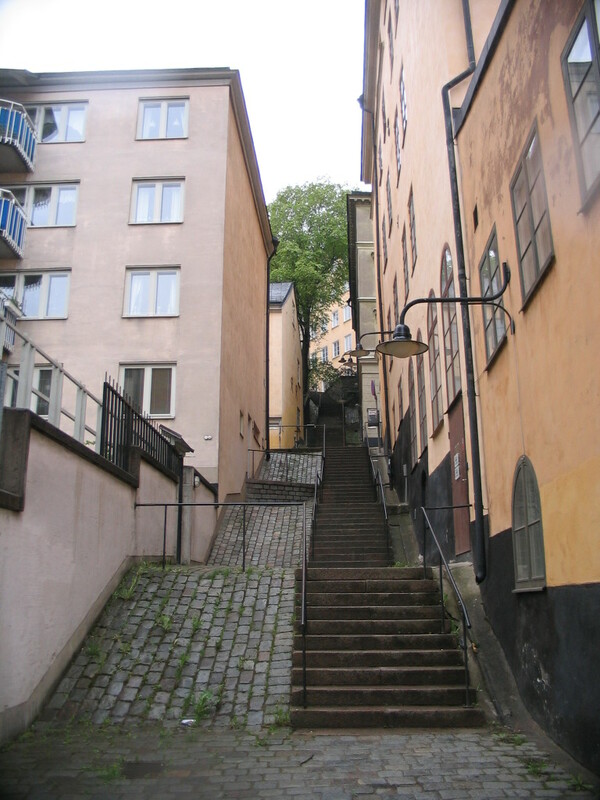 A great cascade of steps (and some sweet cobbleramps) tucked away, going up to Bastugatan from Pustegränd. 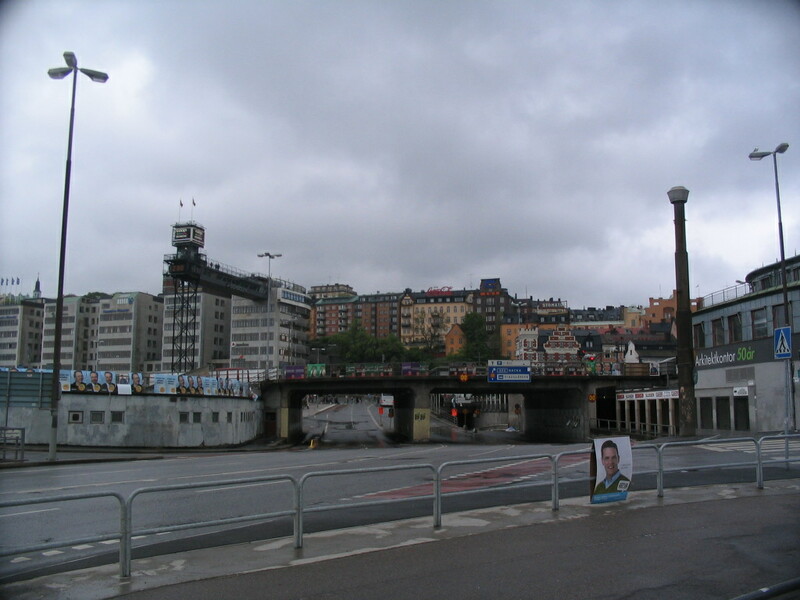 Departing Södermalm to get to back to the train station, I ventured to the underside of Centralbron as it arrives on Södermalm. 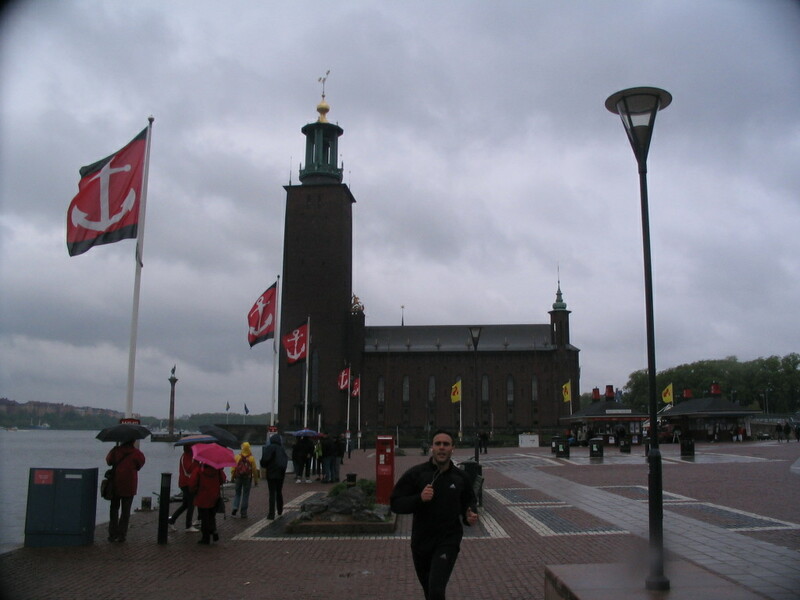 Hiking back along the Centralbron with both RHK and Stadshuset conveniently in view, rain continuing to march through. 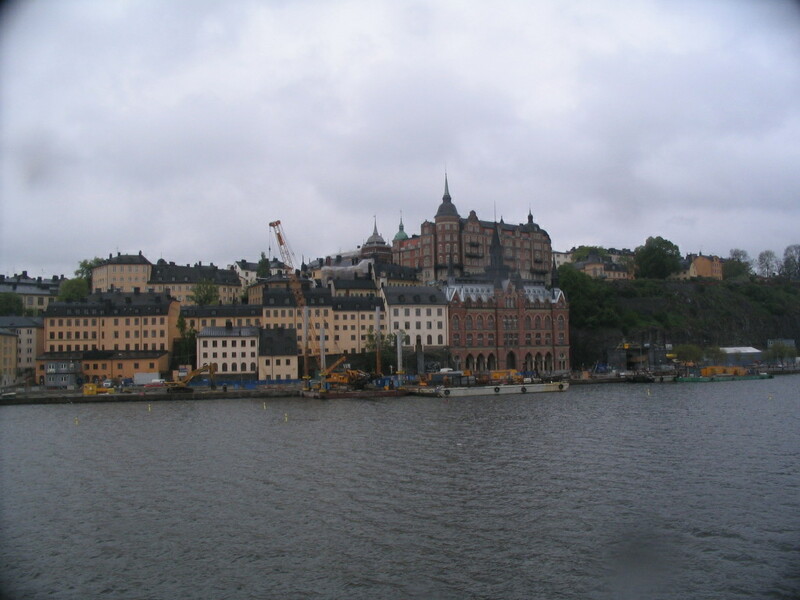 A look back to the bit of Södermalm I'd just been exploring, the black Maria Hissen spire in front, just to the left of the verdant cliff. 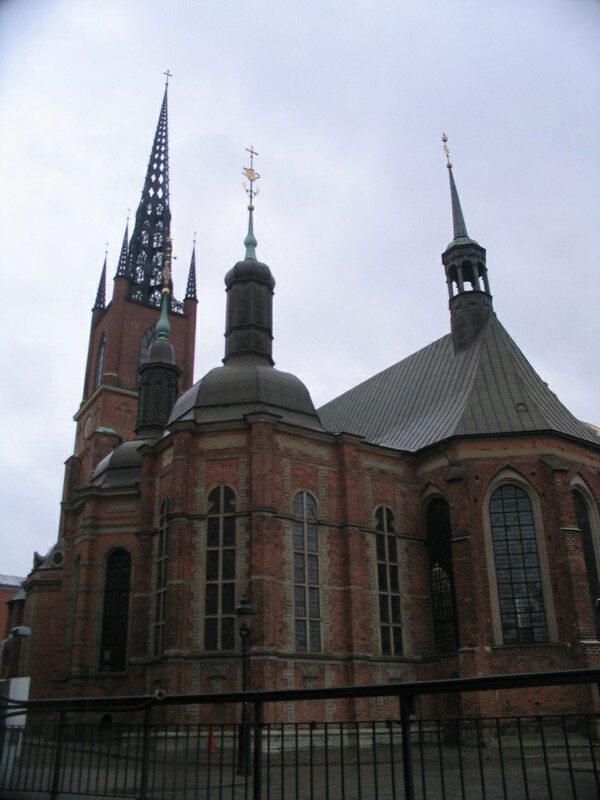 Hey look it's Riddarholmskyrkan! What a surprise. But lo, an actual surprise! 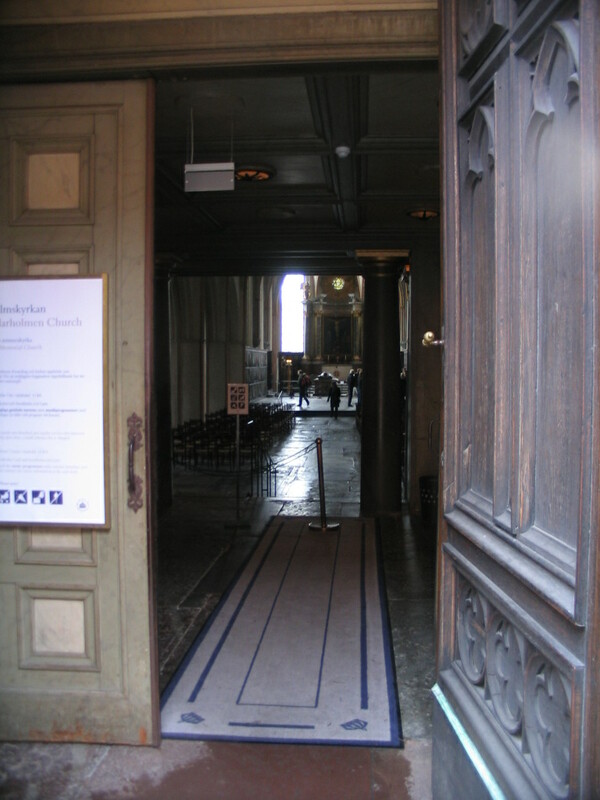 I walked around to the front of RHK and the door was open! 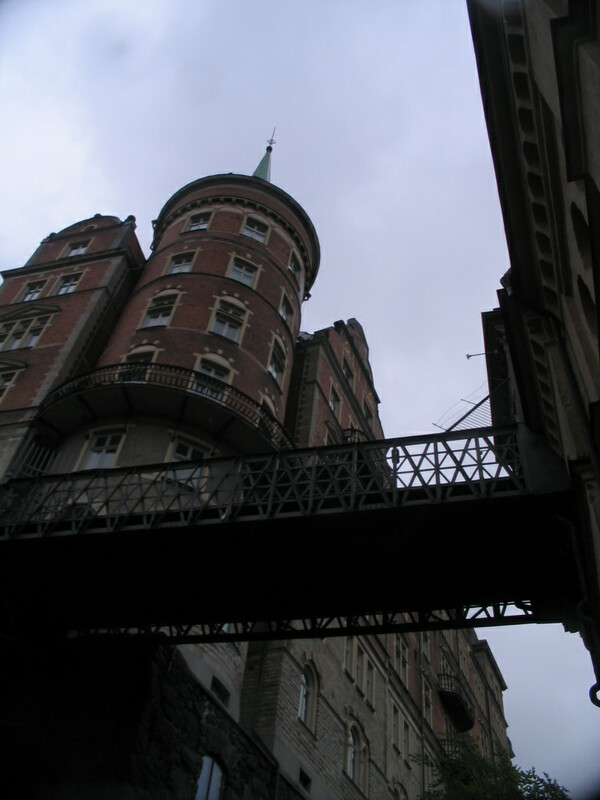 I didn't explore inside, because time was getting short, but it was neat to get a glimpse. 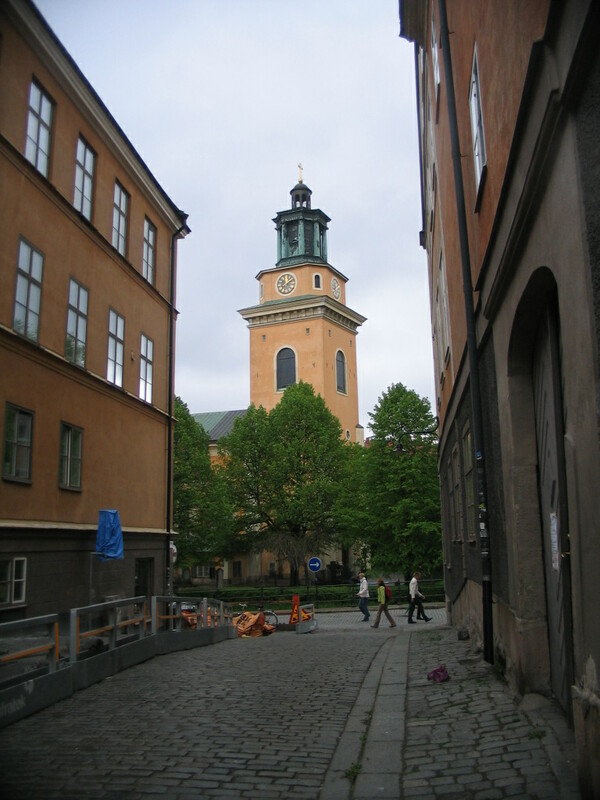 One last view of Stadshuset.